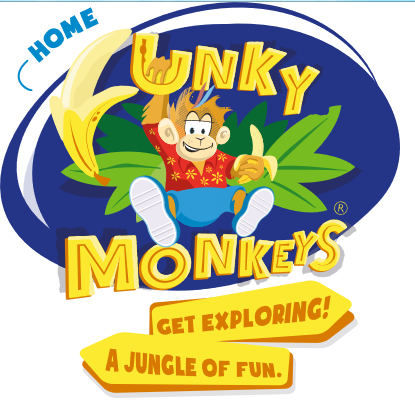 Funky Monkeys is a soft play centre franchise that offers a ‘jungle of fun’ for all children to enjoy along with their families and carers. Each soft play contains plenty of climbing frames, ropes, slides and other soft obstacles for children under 8 to play with to their heart’s content. There are ride-ons to race as well as themed areas that include the village shop so that imaginative games can be played at the same time as energy being spent! As well as the ever popular soft play aspect, Funky Monkeys offers excellent value children’s parties – parents don’t have to worry about anything and can simply let the team take control, creating memories and fun. Plus there are some great daily activity programmes to keep everyone occupied. All Funky Monkeys soft play centres have an onsite café which provides delicious fresh food that promotes healthy eating wherever possible. Hot and cold drinks are available so that parents and carers as well as the children themselves can recharge and re-energise. The aim behind Funky Monkeys is to provide somewhere safe and fun for children to be able to be themselves and enjoy themselves without any stresses or worries. Family friendly centres offer exceptionally high quality play equipment that allows for climbing, running, jumping, scrambling and imagining.